The extension also indicates that the file is an SZDD archive: the last character is replaced by an underscore (note that KWAJ and InstallShield archives use the same extension format). file is able to determine what the last character was, as well as the uncompressed size of the file. In this case, the original file was called "aadobergb1998.icc". Also, SZDD archives are composed of individual files for each compressed file, and so are properly "compressed files" rather than "archive files" (which concatenate multiple files into one archive file). The file that I needed to expand was an ICC profile for a scanner that was provided as a self-contained Windows installer, which I was able to expand using The Unarchiver. However, the SZDD archive inside couldn't be expanded by the latter. I tried compiling ms-expand.c, a small program for expanding SZDD archives adapted by Daniel Risacher to run on Linux. Trying to compile on macOS 10.14 using the XCode developer tools gcc/clang compiler gave a 'conflicting types error' due to an implicit function declaration. Fixing this required simply moving the main function to the end of the file so that the functions called would have been previously declared. Despite successfully compiling, the program would not expand the archive. 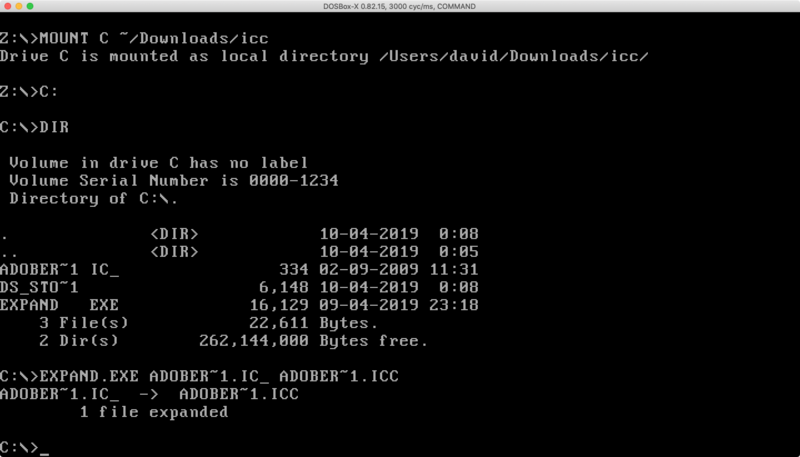 An output file would be created with the name specified in the invocation ("ms-compress adobergb1998.ic_ adobergb1998.icc"), but was simply a copy of the input file. Deciding on a different approach, I downloaded a copy of the MS-DOS emulator dosbox-x using Homebrew, as well as copy of the MS-DOS tool EXPAND.EXE. ADOBER~1.ICC: ColorSync color profile 2.1, type ADBE, RGB/XYZ-mntr device by ADBE, 560 bytes, 11-8-2000 19:51:59 "Adobe RGB (1998)"